Many companies are given the impression that moving their email services to the cloud means giving up the benefits of using their own dedicated mail server in favour of using hosted mailboxes on shared services such as Office365 or Gmail. That’s just not the case, and with Cloud Hosted MDaemon, we’re making it perfectly feasible and cost effective to have your own dedicated email server, hosted and managed for you by experts on massively reliable cloud infrastructure. These two things are no longer mutually exclusive! 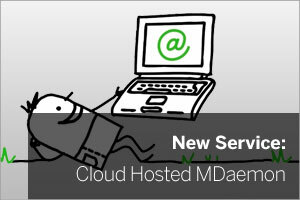 To view pricing visit the Cloud Hosted MDaemon page on our web site. What is Cloud Hosted MDaemon? With a Cloud Hosted MDaemon server you have complete and unrestricted access to the both the server and the MDaemon GUI. Features – enjoy access to the full features your server can offer rather than the limited subset you normally see with a ‘shared’ service. Control – complete and unrestricted access to MDaemon means you can manage as many or as few aspects of your email as you wish. Security – fine tune security settings to meet your requirements and reduce the inherent risk of sharing a platform with other companies. Accessibility – complete access to all of your server’s log files. Flexibility – lets you do the things you want to with your email! Why move to a cloud service? Focus on your business – save time spent managing licences and server/ network infrastructure. One, simple monthly fee – no unplanned infrastructure costs, just one, predictable all-inclusive monthly fee. Multi-site support – easier and better support for accessing email from multiple locations, ideal for companies with more than one office or roaming workers. While this is most definitely your server, and you’re the one in control, we’re here to make sure it’s always available, backed up, and that it’s running smoothly around the clock. This service is available now, both direct and via our network of trusted partners. To see how little your own managed MDaemon server will cost visit the Cloud Hosted MDaemon page on our web site where you’ll also find more information and a handy Frequently Asked Questions page. Call us for a chat! We’re keen to talk to you about the many benefits of upgrading to Cloud Hosted MDaemon. We can help with migration and may be able to help with a preferential arrangement if you’ve recently renewed your licences.